Scottsdale has an ideal location in the heart of North-East Tasmania. Firstly, Tasmania is located off the south-eastern tip of mainland Australia, and the main port of entry to Scottsdale, Launceston Airport, is one hour's flight from Melbourne International Airport. 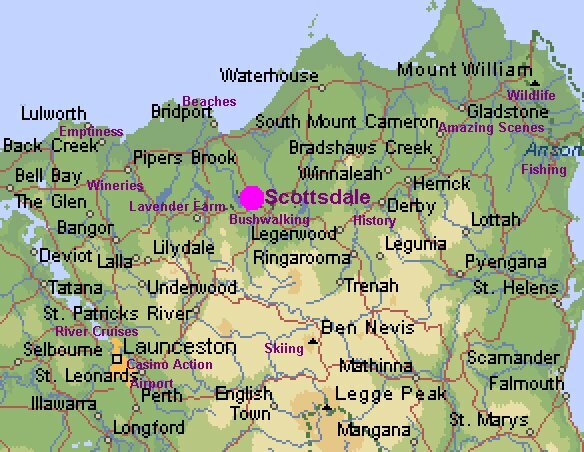 Scottsdale is one hour's drive from Launceston (70km). It is just 15 minutes drive (21km) from the sands of Bridport, and just over an hour from the catamaran terminal at George Town. It is located on volcanic red soil, with low mountin ranges to the south and west, and to the north and east, the blue sea. Scottsdale is a lovely town to visit, or to live in. New members of the community are accepted quickly by the friendly locals. You will love the shopping atmosphere. The main industries are agriculture (potatoes, onions, beans, carrots, poppies, pyrethrum, beef and dairy cattle, sheep and much more) and forestry. Our main factory is Simplot, where most of the potato chips for the Birdseye brand are produced. We also have the DSTO offices, where research goes into the making of foods for Australia's defence forces. Tourism is becoming increasingly important. It is quite a wealthy town, with low unemployment and a steady growth rate. "More than anywhere else in Australia, Tasmanians enjoy four distinctly different seasons, and each one has its unique pleasures and appeal." Scottsdale's climate is generally very temperate and mild. Because Tasmania is so compact, you can easily ski on Ben Lomond in the morning, and in the afternoon surf at Tomahawk. Always be prepared for the changes in the weather. Summer around Scottsdale means "miles of squeaking sand, the white lace of surf, warm sun on your back, breezes from the sea, green light on fern fronds and insects buzzing over amber mountain pools. It's the time to head for the beaches or bushwalk in the mountains, to cast a lure for trout, to cruise offshore by sea kayak or under sail." Summer is a season of fun and festivities around Tasmania with many exciting events occuring over the summer season. Scottsdale Special: Summer is special in Scottsdale. Walk outside your accommodation at 9 o'clock in the morning, and feel a gentle warmth rising from the earth. There is a special smell in the air: an agricultural scent, of the grass, of the flowering jasmine, of the bushfire smoke. It's something I will always treasure. One of my favourite smells around. The maximum high usually ranges from about 21ºC to 33ºC. The sea temperature is comfortable without wetsuits in summer and autumn. My favourite season. So miild, the sun lasts well into the evening, casting down the town's streets, across to the swimming pool and out to the green forest, ending in beautiful sunsets, thanks to daylight saving. March is probably the best month to visit Tasmania, just beautiful. And after that is when the truly remarkable action of nature occurs: "In the country, the glassy water of rivers and estuaries reflects the gold and red of oaks, elms and chestnuts. By alpine lakes, deciduous native beech blazes with changing colour...Apple pickers are busy, and in the vineyards, grape picking can be a social event, with picnics, music, laughter and a glass of last year's vintage to celebrate the harvest." Average high, 17ºC to 23ºC. Very nice. One of my favourite activities is simply to rug up and take a walk or bike road along our country roads and simply think about how beautiful this place is, and how I want everyone around the world to experience what I am doing right now. They would be truly jealous. "Winter is a dusting of pure white on highland peaks, the lcear light of a pale sun on a deserted beach-and later, the crackle of peppermint logs and the warm aroma of hot coffee. Oudoors, it's the season to have fun in the snow, ski over frozen tarns or to stroll the quiet streets of an historic country town. Indoors, it's a perfect time to search for hidden treasures in a gallery, antique or art & craft shop, or to sample Tasmanian fare in a cosy restaurant," by the glow of an open fire. Please note: Scottsdale does not experience snow during the winter season. The high peaks around the area do, but Scottsdale is generally too mild for snow to fall. Highs range from 10ºC to 14ºC. Oh, its just so wonderful to see the leaves and flowers coming onto the trees and plants. Its warming up at last! "Spring is cool, fresh and green with drifts of daffodils in cottage gardens, a froth of blossoms in apple orchards, a blaze of wildflowers in alpine gardens and coastal heathlands, a wave of new born animals in the ountryside. It's the season for celebrating a new beginning as nature bursts into life." Highs range from 15ºC to 21ºC. Quotations are from Tasmania Holiday Planner, p66 and p67. Home | Getting there | Sport | Nightlife | Attractions |Accommodation | Links | Email Us!